Humane Multi Live Catch Mouse Trap will catch up to 10 mice at a time. 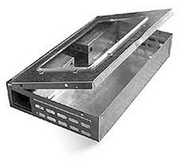 This metal trap is made of galvanised steel and will last for years. Once mice have been caught inside the trap they cannot escape, ensuring the mice are contained until released. Easy to use these Humane Multi Live Catch Mouse Traps have a clear window view panel so that you can see when this method of mouse control has been effective! NO POISON - NO KILL traps to humanely catch mice alive!